Product categories of Electrode Holder, we are specialized manufacturers from China, Electrode Holder, Tig Electrode Holder suppliers/factory, wholesale high-quality products of Welding Clamp R & D and manufacturing, we have the perfect after-sales service and technical support. Look forward to your cooperation! Electrode Holder holding the role of welding electrodes, welding current conduction welding equipment. Is supporting the use of arc welding, SMAW when, for holding and manipulating rod, and to ensure that the handheld appliances and insulated electrode electrically connected. 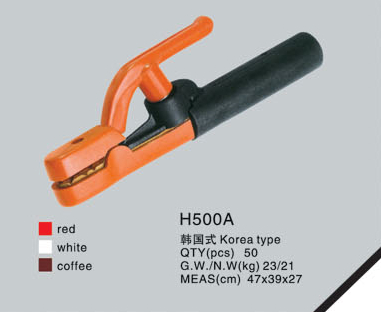 Welding Clamp has a protective shell, anti-shock protection, temperature rise, resistance welding spatter resistance, fall and other major technical indicators.